LONDON: 3 FEBRUARY 2017 - The directors of ECR Minerals plc (the “Directors”) provide the following update regarding the Company’s gold exploration licences in Victoria, Australia, which are to be held by its wholly owned Australian subsidiary Mercator Gold Australia Pty Ltd (“MGA”). As announced by ECR on 3 March 2016, MGA has agreed to acquire two exploration licences in Victoria, EL5387 (the Avoca project) and EL5433 (the Bailieston project) from Currawong Resources Pty Ltd (“Currawong”). To complete the acquisition, it is necessary to transfer the licences from Currawong to MGA, with the consent of the Victorian government. In the meantime, the Directors consider MGA’s rights in respect of the licences to be secure under the terms of the agreement with Currawong, and for practical purposes, the Directors consider MGA to be the owner of the licences. The Directors have revived the process of transferring the licences from Currawong to MGA, which had floundered in mid-2016 whilst the Company was subject to management changes and corporate reorganisation. The transfer of EL5433 (Bailieston) from Currawong to MGA was expected to be approved by the Victorian government in January 2017; the Company continues to expect that this transfer will be approved shortly. EL5387 (Avoca) reached the end of its five-year term on 24 January 2017. Application for renewal of this licence for a further five-year term has now been lodged with the Victorian government. After this application is approved, the renewed licence will be transferred from Currawong to MGA. MGA has directly applied for two new exploration licences, EL6278 and EL6280 (as announced by ECR on 13 June 2016). Neither of these licences has yet been granted, although it is believed they are in the final stages of the approval process. EL6278 is close to the Avoca project, and EL6280 is nearby the Bailieston project. Further to the Company’s announcement dated 9 November 2016, the consent required under section 44(1) of the Mineral Resources (Sustainable Development) Act 1990 for the planned drilling at the Byron target in the Bailieston project area (the “Section 44 Consent”) was received on 28 December 2016 in the name of Currawong. The drilling programme at Byron will commence once EL5433 has been transferred to MGA and the Section 44 Consent has also been transferred. The Directors are confident that the drilling will be completed in the next two to three months. 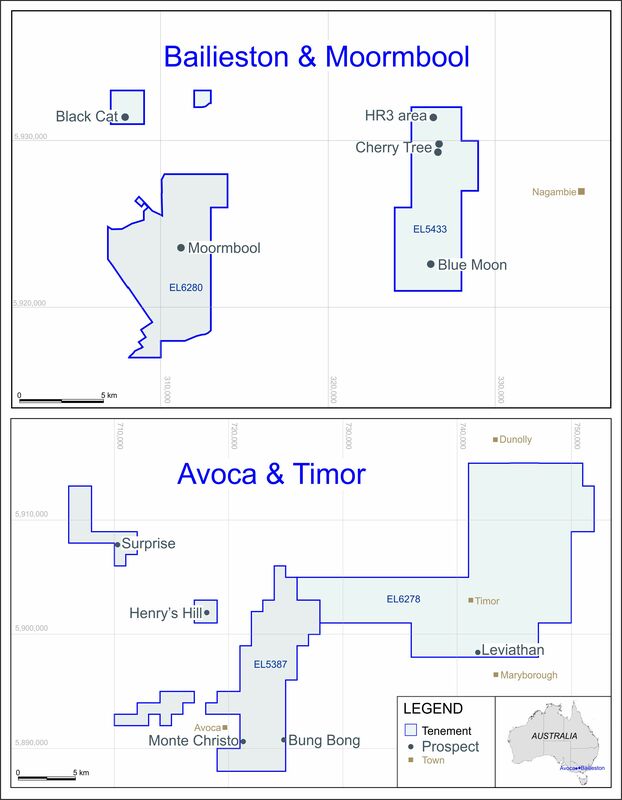 Further announcements will be made as information becomes available regarding commencement of drilling at the Bailieston project, on renewal of the Avoca project licence (EL5387), on transfer of the Avoca and Bailieston (EL5433) licences to MGA, and when the new licences EL6278 and EL6280 have been granted to MGA. “ECR’s Bailieston project located in the Australian state of Victoria, one of the world’s major gold producing regions, is not only in close proximity to two large operating gold mines but has a history of producing high-grade material from underground workings, including from the historic workings at our priority Byron target. The Company is in possession of a dataset encompassing the original nineteenth and early twentieth century production records as well as the results of relatively recent exploration work, including drilling and trenching, carried out in the 1980s. Given these positive indications, we are excited about testing the potential of the Byron target at the drill bit, and look forward to commencing the drilling programme as soon as we can. ECR is a mineral exploration and development company. ECR’s wholly owned Australian subsidiary Mercator Gold Australia has 100% ownership rights in respect of the Avoca and Bailieston gold projects in Victoria, Australia. ECR has earned a 25% interest in the Danglay epithermal gold project, an advanced exploration project located in a prolific gold and copper mining district in the north of the Philippines. An NI43-101 technical report was completed in respect of the Danglay project in December 2015, and is available for download from ECR’s website.